Name us in your charitable gift annuity. YOUR CHARITABLE GIFT IN DECEMBER will enable us to continue our long tradition of education and preservation of New London’s history. 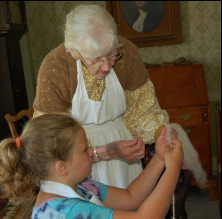 At right: Ade Lauridsen teaching a young student how to prepare wool for spinning.